My lawn is beyond help, can Greenmaster Lawn Care really make a difference? Yes, definitely! Our customers are constantly amazed to see what they thought was a lawn totally beyond repair transformed into a beautiful, lush green lawn. You will be delighted when you see what we can do for YOUR lawn even if has been neglected or suffered damage from the harsh cold weather. Are the prices on the Greenmaster Lawn care website correct? How can you manage to treat my lawn for not much more that it would cost me? Yes, they are correct. The reason why we can provide our services so cheaply is because we buy the very best commercial products to treat your lawn in massive volumes. This drives down the purchase price and we can pass those savings on to you. Not only that but we use the best commercial equipment which improves our efficiency and makes Greenmaster Lawn Care services so affordable. What is the best time of year to start the Greenmaster Lawn Care program? The good news is that there is never a bad time to improve your lawn as it constantly requires attention and care all year round. Throughout the year there are perfect opportunities to carry out treatments to improve the condition of your lawn with amazing results. Depending on the treatment you start with, the effect will differ….BUT…in most case you will see an improvement in as little as ten days. The first thing you will notice is a reduction in weed growth and an improvement in the colour of your grass. Are the treatments that Greenmaster Lawn Care use safe for children and pets? Absolutely. Yes. Our treatments are completely safe for both children and pets, however we do ask that you keep children and pets off the lawn until the herbicide has dried. This only takes approximately 1-2 hours depending on the climate and weather conditions, but after that they are free to tumble around on the lawn as before. The added safety benefit of using Greenmaster Lawn Care services is that you won’t being keeping half used, concentrated weed killers laying around in the shed or the garage. This is a reassuring to a lot of our customers who used to try and treat their lawns themselves. I currently have a gardener. Can Greenmaster Lawn Care work with my gardener to improve my lawn? Many of our customers have gardeners, but because their gardeners do not have the qualifications and expertise to apply the products we use, nor the specialised machinery required for certain tasks, we are quite happy to work with your gardener to improve your lawn (we actually receive many recommendations from gardeners). Together, our services complement each other so that you will have a garden to be proud of. Why do I need Greenmaster Lawn Care Services? Can’t I just buy the products myself? The domestic solutions you can buy from local DIY and garden centres are not as effective as the solutions that a professional lawn treatment company like Greenmaster Lawns use. Not only that but they are also very expensive. We use professional quality products that are simply not available to the general public. These are the same products that are used on premier golf courses throughout the UK that make such a huge difference to your lawn and will set it apart from your neighbours. Not only that but because we buy the very best professional products in such massive volumes we can buy it far cheaper and then pass the savings on to you. 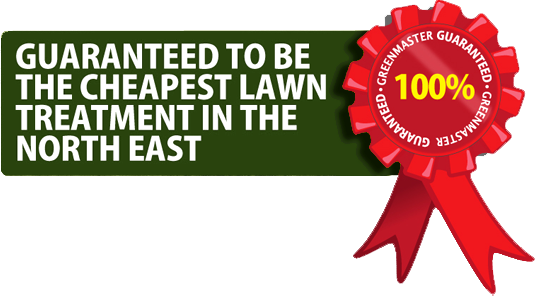 This means that you will be getting the services of our Greenmaster Lawn Care experts and the best lawn treatments solutions on the market for not much more than it would cost you to buy an inferior, weak solution from your local DIY which will not deliver very impressive results. Do I have to be in when the Greenmaster Lawn Care expert arrives? NO. The vast majority of our customers are out when we call. All we ask is that we can get access to your lawn and that your pets are kept inside on the day we call. Then, while you are out shopping or at work, we can do our magic and treat your lawn. You will have a stunning, thick, green lawn completely stress-free and without you having to do a thing. If only everything in life was that easy! I have used some lawn treatment products myself and had to water them in or they would ruin my lawn. Do I have to do the same for your treatment? No, not at all. We only use professional products and you won’t need to worry about watering them in at all. However, in very dry periods your lawn will benefit from regular watering just to keep it looking lush and green. I am interested in using Greenmaster Lawn Care services but will I have to sign a contract? Absolutely not. Our customers use our services year after year because they love the results of having a beautiful weed-free green lawn not because they are tied to a contract. How much does the Greenmaster Lawn Care service cost? This naturally depends on the size of your lawn, but the majority of our customers pay approximately £15 per treatment. However, to be able to give you an accurate price we offer a no-obligation and completely free quotation service. Simply give us a call and we will send one of our lawn experts out to access your lawn and give you an accurate price. How will I know when the Greenmaster Lawn Care expert is calling next? Your next treatment date will be printed on your invoice. This will allow you to make arrangements for us to get access to your lawn if you are not at home. I am so happy with the condition of my lawn that I want to recommend you to my friends and relatives. Do I get anything for doing this? We are delighted that you are happy with our services and love your lawn. The vast majority of our custom comes from referrals from satisfied customers and we really appreciate you telling other people about us. As a thank you and to show our gratitude you we take off a third of the price of your next treatment whenever you tell refer us to others. My lawn is thick with weeds. Can Greenmaster Lawn Care remove them? Yes. This is why our customers love us. Our treatment service not only kills weeds but then gives you a stunning, thick, green lawn that you will love. You don’t need to worry about any hidden extras. Everything is included in the price. This includes our materials, equipment and machinery as well as our labour and expert knowledge. The price we quote you is the price you pay. When our customers realise that our services really are as little as £15 and they really can have a weed-free beautiful lawn for that price they are absolutely delighted. How can I assist Greenmaster Lawn Care to improve my lawn? The only thing that you will be required to do is mow the lawn and water it during dry spells to keep it green. We do the rest.